Antonia Osberger from Z_GIS received a DOC-fFORTE grant for her project “Object-based image analysis for monitoring the impact of natural stressors in Alpine forest”. 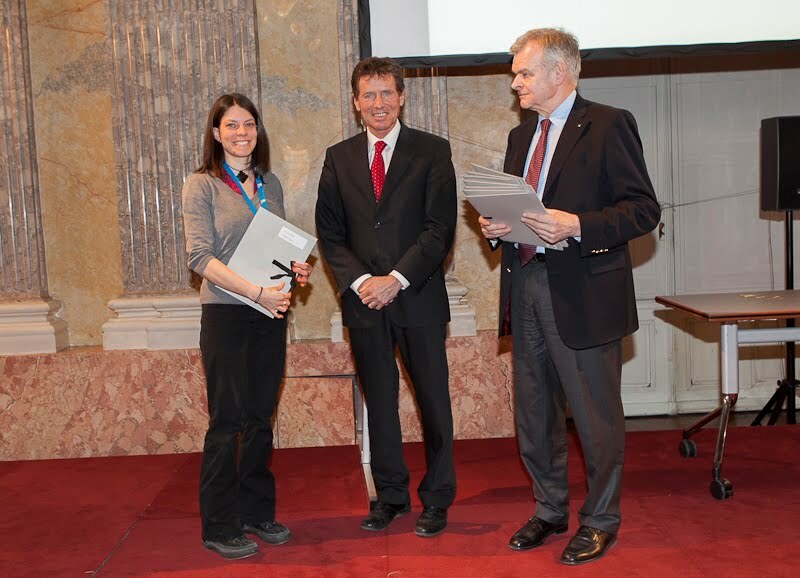 The grant was awarded on Friday, 24 Feb during a ceremony held at the Austrian Academy of Sciences in Vienna. The grant supports outstanding ideas presented by women in research and technology, and is provided for 3 years. Ms Osberger’s project aims at developing an operational framework for automated analysis of forest areas affected by stressors such as storms or bark beetle attacks. The spatial variability and dynamics of a forest ecosystem will be investigated and visualized, emphasizing analysis of potentially damaging events. The overall objective is to support decision-making processes for forest operations purposes, improved regional and national forest management information and assessing the impact of measures. Ausstellung plus Vortrag, Aula der Wissenschaften, Österreichische Akademie der Wissenschaften in Wien, 27.4.2012: "Papier oder PDF - Wissenschaftliches Publizieren heute." Wie werden Forschungsergebnisse heute vermittelt? Wo liegen die Vor- und Nachteile, wo die Grenzen von Buch, PDF, Flash&Co? Am Beispiel einer Kongress-Publikation werden verschiedenste Aspekte gegenübergestellt: haptisch versus virtuell, statisch versus dynamisch, 2D versus multidimensional. Besucher können die open-access Publikation auf Smartphones und I-Pads selbst ausprobieren und mit der Buchversion vergleichen. At the beginning of each year, researchers at Z_GIS are looking back at their achievements throughout the previous year. The publication of our 'Annual Report' marks a milestone where we take stock (usually with some pleasant surprises caused by fellow researchers' activities we did not fully take notice of during the year), and use this as a baseline for planning next steps. 2011, by all measures, certainly was an outstanding year. Launching the GIScience doctoral college and flagship research projects like MS-MONINA, or successfully switching the 'Applied Geoinformatics' MSc to English language will all have long-lasting impacts. New leadership in several UNIGIS program areas will make a difference to our distance learning students, and all events ranging from GIS Day to AGIT / GI_Forum were received exceedingly well. The new year of 2012 already promises to hold in stock even more changes and challenging developments, and everybody at Z_GIS is keen to stay on top of their game - contributing to leading the field of Geoinformatics and GIScience in its many facets, as a stimulating and innovation-rich interdisciplinary domain. Want to read our 'yearbook' in detail? Go to http://tinyurl.com/ZGIS2011 ... or just drop us a note for a hardcopy version. The GIScience Institute of the Austrian Academy of Sciences and the Centre for Geoinformatics cooperate in organizing a regional workshop in Lobesa, Bhutan, led by Prof. Strobl and Dr. Shahnawaz from February 9-15. 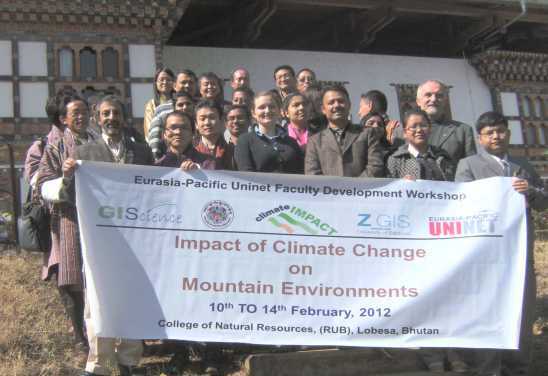 Hosted by the College of Natural Resources (CNR, Royal University of Bhutan - RUB) and supported by the Eurasia-Pacific Uninet, this GIScience-based advanced training for teachers and professionals brings together participants from Bhutan, Nepal, India and Austria. After the opening ceremony introduced by CNR Director Dorji Wangchuck and chaired by the RUB Vice Chancellor Dasho Dr. Pema Thinley, participants followed a series of lectures exploring the foundations of climate change impacts on mountain environments, and concepts for spatial analysis methodologies. Due to a diverse range of backgrounds in Geography, Forestry, Ecology, Hydrology and Development Research, participants created a unique environment for exchanging experiences and viewpoints. The majority of time was dedicated to practical work on several case studies, building practical experience with functionalities of GIS required for researching and monitoring climate change effects with a particular focus on mountain environments. Lectures and trainings all were conducted at CNR's beautifully situated campus in the Punakha valley, providing an excellent backdrop to a unique learning experience for all participants. Special thanks go to Mr. Ugyen Thinley from CNR for the perfect organisation of this workshop!